Girl dismembered by her stepmother. Witches congregate, raise ruckus with the Dies Irae. Creepier use of 5/8 time signature? To cut the scary stuff. In the original version, or the wind band one I joined several IU music students in slaughtering. Bones sufficiently chilled by the end. Because you can't have enough of a good thing. Pinned to your seat, with great vehemence. A soprano, a cimbalom, a violin and a double-bass stop time, morbidly. Violinist Gordan Nikolić made a huge impression with his big-hearted playing when he was here with the London Symphony Orchestra last week—he's the concertmaster—and the lanky, twitching player can be seen to great effect in this video of Mozart's Sinfonia Concertante, K. 364, with violinist Julia Fischer. (He plays viola.) Nikolić is the only violinist who will be played by David Koechner when his biopic is made, and watching him and Fischer play keeps summoning pictures of Julia Roberts and Lyle Lovett to my mind. Can't figure out why. There's a great moment at 2:01 in Part 2 of the recording where Nikolić bows to Fischer, only to remember that it's his turn to play, and not hers. So anyway, Nikolić and Fischer have YouTube goodness, Richard Ford has a perceptive essay on sports in the NYT, Zack has a bracingly blasphemous (and racist!) post on Fool's Gold Coast, and I have copy to edit and deadlines that probably ought to be adhered to. I've been posting a great deal on violinist Alina Ibragimova lately, as has The Overgrown Path, but she's got an artsy, Anton Corbijn-esque video directed by Sussie Ahlburg up on the YouTube now, and you should see it. Luv taht black and white. Also, György Kurtág gave a rather Kurtágian tribute to his friend György Ligeti. Even when he's writing words and not notes, it appears, he uses the fewest particles needed to make powerful statements. Richard Taruskin, a scholar of great learning and erudition who, as one of his editors once memorably put it, "only starts warming up around the 3,000-word mark," has uncorked a 12,000-word review/lambasting of three books purporting to argue the cause for classical music in the New Republic. With wicked fun, he destroys the arguments of Julian Johnson, Joshua Fineberg and Lawrence Kramer. He also inadvertently raises the profiles of these books to heights, and generated amounts of conversation about them, that they would never have achieved had America's most public musicologist not written about them at length in a national news magazine. Taruskin's lusty bravado and the rude, put-down-laden qualities of some of his writing has always rubbed me the wrong way, since it's more appropriate for a tabloid-writer or some paper you could pick up for free in a sidewalk kiosk. (It's entertaining, but so is a cockfight.) The gloating, the I've-forgotten-more-than-you'll-ever-know arrogance, the snide assertions, none of it is the finest way to discuss either the music, its practitioners or the words written about it. I've argued in the past that classical music shouldn't be treated with kid gloves, or as if it's not part of contemporary culture, but Taruskin's intellectual thuggishness ultimately detracts from his arguments. My problem with Taruskin, who, yes, has forgotten more than I'll ever know, at least about the gamba, is the weakness of those he bullies. He's like the schoolyard tough with a penchant for the obvious who finds the skinny kid on the playground, then says, "You know what your problem is? You're too skinny!" before beating him senseless. Fineberg's book "is sooner meant to comfort the author's own cohort," Taruskin writes at one point, and he's right. Fineberg is a Boston University prof and composer who's taught at Harvard and Columbia, and I've heard some of his music. But I remember more his grandiose spoken introduction, starting with "I don't like melody," and then explaining how he integrated Japanese sounds into his Western tonal palette. Dude, Boulez did it 30 years ago, in his Rituel for Bruno Maderna. My point is that a book by Fineberg is only going to be read by other specialists, his friends who might give two cents about the future of classical music. Yet Taruskin devotes so many words to the guy that you'd think he's Alex Ross, or John Adams, a writer or composer with a broad following whose prescriptions and opinions might carry weight outside of Cambridge. Given his word-length, it would've been impossible for Taruskin not to touch on What Must Be Done, and he argues in favor, or at least tacit approval, of "accommodation," to the vagaries of the marketplace. This is, he rightly states, "a normal part of the evolutionary history of any art." Today, that accommodation takes the form of, say, Jennifer Higdon getting a commission ahead of Marco Stroppa, the Italian modernist. But, and this is the important part that gets left out of these discussions every single time, the pie takes in concert life on four continents, and is big enough for both to take a bite out of it. The accommodation he's talking about isn't a black/white, either/or scenario, given the number of performers and institutions out there. The best will win out in every style. Yet Taruskin devotes his mental energy not to this phenomena, but decrying the efforts of three writers with extraordinarily small readerships. The only way to persuade people to listen to classical music is to have them listen to classical music. It sounds tautological, but the music is the best argument for itself. No book about why people should care can fully communicate that, just as a book about visual art will fail without illustrations. Taruskin's vast reading leads him to think that others are as willing to read up on the music as he is. (He does agree with the point that writing about music only paraphrases the experience of listening to it, though.) Classical music doesn't need saving from its devotees, it just needs curious people, like Taruskin was once, who will take a chance on something they haven't heard before, and who then discover something they cannot live without. New reviews of recordings from the Artemis Quartet, with Leif Ove Andsnes; the Deutsche Kammerphilharmonie Bremen, mit Paavo Järvi; and the Chicago Symphony Orchestra, with Bernard Haitink. Time Out Chicago. October 25, 2007. Mega-plaudits to the Artemis and Järvi's band, plaudits to the CSO. The level of talent displayed by young musicians these days often takes my breath away. Not prodigies, who have been with us since, maybe not time immemorial, but certainly for a good couple centuries, but those who made it through music school and who now populate regional orchestras and freelance ensembles. And now, with the aid of Ye Olde Blogosphere, they're writing about their fears and concerns for all to read as they make their way on up the career ladder. Two of them have been in Chicago recently. LA-based Gabrielle of Lone Oboe took the Chicago Symphony's English horn audition, and gives a behind-the-curtain look at that humbling experience, and Indianapolis-based bassist (-bassed?) and reviewer Chantal Incandela of Mahler Owes Me Ten Bucks made the trek to the CSO's recent Mahler concert. Much weeping followed. Gabrielle certainly speaks with understandable relief when she says "I didn't have any funny embouchure problems." Those can really trip you up, and are no laughing matter. Then there's vulture of culture Francis Sadac, who couldn't possibly believe that nobody would be interested in the musings of a "thirtysomething single urban professional Filipino immigrant organization change consultant living in Chicago," could he? His From the Ledge writes about theater, musical theater, film, and identity issues. Go say hi. Timothy Mangan, the classical critic for the Orange County Register, has done the world the service of reducing the 600+ pages of Alex Ross's The Rest Is Noise to a mere 122 words, and (bonus!) they rhyme! His poem "The 50s, in verse," is over on the OC Arts Blog. Move over, Edward Lear. If Mangan would do the same for Richard Taruskin's Oxford History of Western Music, we'll just drop everything right now and canonize him on the spot. Enthusiastic, cerebral, muscular in equal measure, the Americans of the Brentano String Quartet brought a smartly conceived program to Mandel Hall Friday night, as part of the University of Chicago Presents series, and proceeded to flesh it out in spectacular fashion. They, as well as contemporary-music star soprano Susan Narucki, brought pieces that either presented or foreshadowed the achievements of their composers, but, most importantly, gave pragmatic, rather than didactic, performances of them. Bach's final Contrapunctus from the Art of Fugue gave the audience Bach at the end of his life; Beethoven's E flat quartet, Op. 127, showed Beethoven at the edge of his supreme late quartets; and Schoenberg's Second String Quartet displayed Schoenberg at the very beginning of his atonal leap. 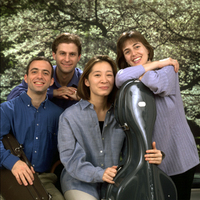 The quartet, in residence at Princeton University, last played here three seasons ago, also in Mandel Hall. Bach's Art of Fugue inspired them to commission ten composers to write companion pieces to various Contrapuncti, including Shulamit Ran, Sofia Gubaidulina, and Wynton Marsalis (big mistake on that last one). I remember them sounding constricted in the Bach movements then, with little vibrato. Two years later, they've chilled out considerably, and now create a sea of passing counterpoint, instead of clearly etching each individual voice. Schoenberg's quartet is, famously, his first atonal piece. Susan Narucki sang Stefan George's poems in the third and fourth movements with admirable directness, avoiding any mugging of extra-musical attempts to attract attention. Her silvery soprano and exquisite musicianship were all that was needed. The quartet was highly attuned to Schoenberg's dense writing, playing with a wide variety of colors and breathing in heavily the late Romantic atmosphere. They closed with a nervy, edge-of-their-seats performance of the Beethoven's quartet, following intermission. First violinist Mark Steinberg (above, far left) is a marvelous leader, his sound coming from a steely core, helped by his incisive articulation. Cellist Nina Lee appears to be having a cellorgasm and achieving an exalted state of rapture often, but then, it was the theorists who decided to call resolutions "climaxes," so I suppose it's not her fault if she really, really enjoys herself. She's a lusty player, too, able to give excellent definition to the quartet's lowest range. Violinist Serena Canin and violist Misha Amory are responsive players, with Canin's tone largely mirroring Steinberg's. This was Beethoven played the way it ought to be, with vigor matched by a willingness to take risks, to stretch or hurry a phrase expressively, and trust your partners to follow you. Contrast it with the Pacifica Quartet's performance of this same quartet one week ago, in the first concert of their Beethoven quartet cycle this season. The Pacificans walked on eggshells, hampered by first violinist Simin Ganatra's thin, dry tone, and sounded as if they're playing everything "in quotation marks." The Brentano players simply said what they mean. Forthrightness is as admirable a trait in chamber music as it is in the rest of life. John von Rhein reviewed the entire Pacifica Quartet concert in the Chicago Tribune, as well. Just kidding. But Opera Cabal has had to find a new venue since the Zhou B Center did not have the proper PPA (Public Place of Amusement) license to host a public event, such as a four-day festival of contemporary music and performance art. Or maybe the City of Chicago simply couldn't handle the mad truth being flung their way by Dal Niente's performances of Stockhausen and Claude Vivier, or Sonic Inertia's percussion-centric concert. Karlheinz, still fighting the establishment. But we're leaning towards the lack-of-permit interpretation. This isn't the first time an event has run afoul of the police at the Zhou B. Center. In July, they closed the Poetry Foundation's Printers Ball, also for not having a PPA. Despite the loving care bestowed on Wagner's Siegfried Idyll last night by the Chicago Symphony and Bernard Haitink, no one would have expected the soft, lyrical passages of Mahler's Sixth Symphony to be those that focused your attention. And yet it was so, as the mutual admiration of the orchestra and its conductor progresses ever farther. Haitink placed the Scherzo second and Andante moderato third. That third movement proved to be the most moving part of the evening, the moment when everything was placed in high relief. Each voice and instrumental choir was transparently clear and audible from the others in a model of musical clarity. The emotion finally gushed over the edge when the violins played the big theme, sincerely reveling in its overwhelming power. Tempos were on the slow side all night, and the entire symphony clocked in at an hour and a half. That it never felt too slow is testament to the strange musical alchemy between Haitink and these musicians, a reserve of some sort of trust that lets them adopt his ideas without forcing their own ideas of how a piece ought to be played. That overall slowness gave Mahler's tender, quiet measures the space to breathe. The first movement's "Alma" theme was one of them, and the various chorales in the winds took on greater prominence. Mahler's symphonies often seem to progress from one loud, brassy highlight to another, but this performance was, given the plonking cowbells, literally one performance that took time to smell the flowers. Principal percussionist Cynthia Yeh almost took a header off her platform after the second hammer blow in the finale. The wooden mallet, something out of a Warner Bros.' cartoon, looked as if it weighed more than she does, and nearly tagged percussionist James Ross on the forehead as she fought for her balance in her follow-through. At least, that's what it looked like from my seat; the reality may have been less dangerous. (Haitink only plays two hammer-blows, by the way). The first movement march and second movement Scherzo moved deliberately, with the trombones glowering instead of bellowing through much of the march. Clarinets and oboes wailed, and bass clarinetist J. Lawrie Bloom displayed a mellow tone in the depths of his instrument's range. Tubist Gene Pokorny played the last movement's solos with grace more befitting a cello, and with entirely as much warmth. I point all this out because record producer James Mallinson, with LSO Live and CSO Resound discs to his credit, was reported, Waiting-for-Guffman-like, to be on the premises this week, and these concerts might end up on disc. You can compare this review to the disc when it comes out, if you feel like it. I probably will, at least. Haitink paused after the final pizzicato, letting the sound die away and the conclusion to register with those in attendance. The ovation began after several seconds of silence, for once taking a work's resigned message to heart. Thirteen musicians, with one string player to a part, played Wagner's Siegfried Idyll as a pre-intermission prelude, giving Richard's gift to Cosima as a gift to the audience. The audience seemed to relish the chance to applaud for these players as soloists, instead of as a group. They entered and exited together, in the European fashion, and bowed together as if they were a chamber ensemble, which I guess they were. Concertmaster Robert Chen laid an old-world sound on the score, giving it extra gravity, and principal horn Dale Clevenger stepped up nicely for his numerous solos. Haitink conducted without a baton and without a podium. Wagner's gift says a great deal about him, and last night, it said a lot about its performers.